The biggest difference between TV brands with high and low brand recognition is a user experience-first strategy, ANATOMY’s report suggests. But, according to ANATOMY CEO Gabriella Mirabelli, “While networks consistently indicate that the viewer is at the center of their thinking, they don’t seem to actually analyze how users truly behave.” User experience is the key to making a TV network relevant in digital spaces. TV brands with higher brand recognition among young millennials (e.g., Netflix) are extremely social media savvy. ANATOMY found that these brands know when to post and what to post on to drive higher rates of engagement. For example, according to ANATOMY, Facebook posts published between 12-3 PM generate “236% more engagements” (reactions, shares, and comments). 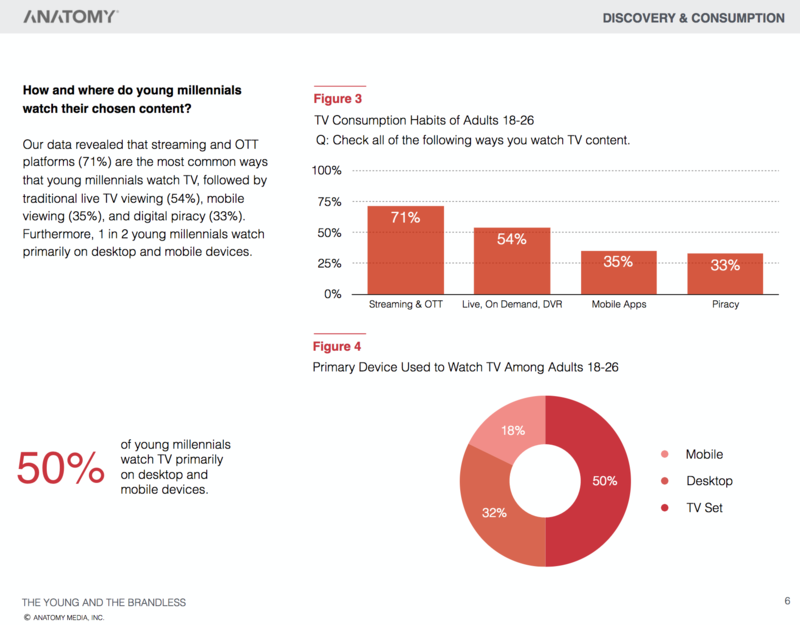 TV brands with higher brand recognition among young millennials (e.g., Netflix) are extremely social media savvy. ANATOMY found that these brands know when to post and what to post on to drive higher rates of engagement. For example, according to ANATOMY, Facebook posts published between 12-3 PM generate “236% more engagements” (reactions, shares, and comments). A TV network’s website or app is also an important touchpoint for its brand in digital spaces, but people judge websites quickly — in about “3.42 seconds”, according to ANATOMY. TV networks with higher brand recognition had easy-to-user user interfaces on their websites and apps. They made it easy for people to watch shows, discover new content, and find information about shows. There is a lot of other great data in the report, which you can download for free here.